Americans did not start calling the president’s wife the “First Lady” until some time in the middle of the 19th century. Some people say Zachary Taylor was the first to use the term in his 1849 eulogy on the death of Dolley Madison. 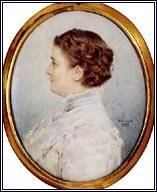 Others maintain that Harriet Lane, niece of President James Buchanan and official hostess for the only bachelor president, was the first “First Lady.” In 1860, Frank Leslie’s Illustrated Monthly described her as, “The Lady of the White House, and by courtesy, the First Lady of the Land.” By the 1870s, newspapers all over the country used the term in their coverage of the activities of Lucy Webb Hayes, one of the busiest and best-loved hostesses ever to preside over the White House. 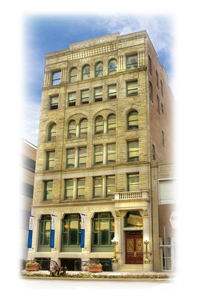 The First Ladies National Historic Site in Canton, Ohio, centered on the home of Ida Saxton McKinley and the City National Bank Building, which serves as the Education and Research Center, provides long overdue recognition of the contributions of all the women who have held the title. No matter their personal style, influence, political interest, or popularity, these remarkable women helped shape history. Some first ladies shunned public attention while others reveled in it. Many lived through immense personal tragedy. Americans showered some with adoration and respect. 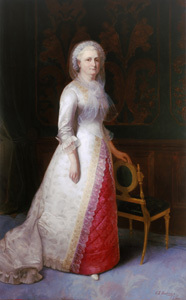 Like her husband, Martha Washington created the first model for subsequent presidential wives to follow, although she said she felt like a “state prisoner” because of the limitations on what she could and could not do. She saw her role primarily as public hostess, and that continues to be one of the duties that go with the job. Dolley Madison served as hostess for the widowed Thomas Jefferson, along with his daughter, Martha Jefferson Randolph. She became a celebrity for her outgoing and vivacious nature and greatly enlarged the social duties of the first lady during her husband’s own presidential term. Numerous women became symbols of personal strength and integrity during times of crisis. Four first ladies lost their husbands in presidential assassinations: Mary Lincoln, Lucretia Garfield, Ida McKinley, and Jacqueline Kennedy. Abigail Adams, Lou Hoover, Eleanor Roosevelt, Rosalynn Carter, and others were full partners in life and in office—confidantes for their husbands and strong advocates for policies they believed in. In their own way, each first lady both reflected and affected the attitudes of society of the time about appropriate behavior for women. Bess Truman stuck with traditional charity work. Betty Ford became an outspoken proponent of women’s rights. When she underwent surgery for breast cancer, she helped bring much needed public awareness to this once taboo topic. She also lobbied for the ratification of the Equal Rights Amendment. Hilary Clinton, the only first lady to date with a law degree, has broken barriers for women through her own political career. Laura Bush has made education a primary focus and is the honorary chair of the Preserve America initiative. Only time will tell what shape the role of the first lady will take in the future. The home of First Lady Ida Saxton McKinley is at the center of the First Ladies National Historic Site. The earliest section of this multi-part building is the two-story, gable roofed house c. 1841. Ida Saxton’s father, a socially prominent and prosperous banker, added to the house c. 1865 (a later addition dates to 1920). The front entry and spiral staircase, the formal parlor, and the third floor ballroom feature fine period finishes. A spiral staircase reconstructed from black walnut winds from the stair hall to the second and third floors of the house. A massive porch wraps around the exterior of the porch, recreated using early photographs of the house. The Saxtons were among the most prominent families in Canton, and the now renovated ballroom on the third floor held many elaborate parties. At one masquerade ball, Ida dressed up as the Queen of Hearts and won the costume contest. The ballroom now houses the collection of First Ladies' photos. Historic photos provided the documentation for the restoration of Ida McKinley’s second floor sitting room and bedroom and William McKinley’s study. Docents costumed as various first ladies give tours through the restored public rooms, highlighting the period the McKinleys lived here. Ida Saxton lived here from her birth in 1847 to her marriage in 1871. Educated in Europe, Ida returned to Canton as one of the most fashionable young women in town. Working as a cashier in her father’s bank, she met Major William McKinley. They married in 1871 and were deeply devoted to each other for the rest of their lives. By 1876, after the early deaths of their two daughters and serious health problems caused by phlebitis and epilepsy, Ida was a semi-invalid. During the years William McKinley served in the United States House of Representatives, he and his wife made their permanent home in the Saxton house. When an assassin shot McKinley in 1901, his first thought was of his fragile wife: “My wife—be careful . . . how you tell her—Oh, be careful.” Ida Saxton McKinley returned to Canton after her husband’s death, visiting his grave almost every day. She died six years later and lies next to her husband in Canton’s McKinley Memorial Mausoleum. The handsome Romanesque seven-story City National Bank Building, a block north in Canton’s historic commercial center, houses the Education and Research Center of the National First Ladies’ Library. The marble banking room, with its restored large skylight and partially restored glass block floor, is now a large meeting/reception/ exhibit hall. Also on the first floor is a small library room, with a spiral staircase leading to a book collection on the mezzanine. This library has a collection of books that replicates the library that First Lady Abigail Fillmore created. Approximately 500 artifacts, including 150 original dresses and accessories, provide a look at each first lady’s personal style and the fashions of the time. The second floor contains the research library. Visitors can view films and documentaries on the first ladies and attend author lectures and live presentations in the 91-seat Victorian Theatre on the lower level. The First Ladies’ Library uses the renovated upper floors of the building as conference spaces, research rooms, archival processing and storage space, and offices. The First Ladies National Historic Site is a unit of the National Park System. The Saxton McKinley House is located at 331 S. Market Ave., Canton, OH. The Education and Research Center is located at 205 S. Market Ave. Both the Saxton House and Education and Research Center are open only for guided tours. Tours are offered Tuesday–Saturday on the half hour from 9:30am to 10:30am and from 12:30pm to 2:30pm. From June 1–August 31, tours are also offered on Sundays on the half hour from 12:30pm to 2:30pm. An admission fee is charged. For more information visit the National Park Service First Ladies National Historic Site website or call 330-452-0876. The National First Ladies’ Library website also has a wealth of information on programs and events as well as biographies of each First Lady. The Library’s interpreters and educators provide a variety of tours, programs, and classes at the site and in local schools.